After being released on 360 and PC to scathing reviews you have to wonder how much twelve months of bad publicity affects the decision to release the same game on PS3. Especially seeing as PS3 gamers are more used to quality 360 hand-me-downs like Bioshock and Mass Effect 2. Let’s give this a fair go though. It can’t be that bad, maybe the devs have fixed the problems since the original release. The schizophrenic AI that went from blind to instantly knowing where you are and telepathically informing every soldier on the base being one of the main complaints. Well that’s still there, so not a great start. The story is forgivably simple (we just want to pop some melons after all), you’re in the army taking down South American drug lords. Actually, your team spends the first half of the game screwing up every mission, causing you to get left behind. 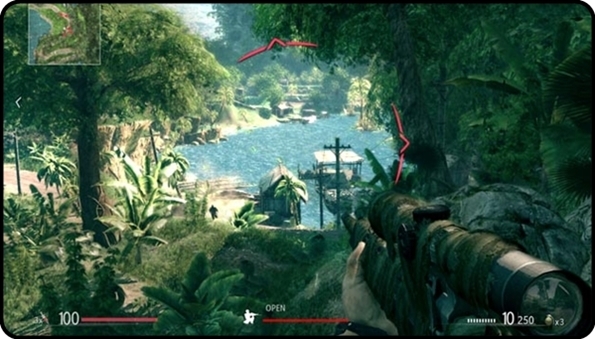 At least the mainly jungle environments are well detailed and refreshingly green compared to most military shooter’s obsession with sand, rocks and corridors. As the title suggest, your main role is that of a sniper. So if you don’t like squinting into the distance to pick out your kills this isn’t for you. At least the enemies glow red once you do manage to track them down. To make things more interesting than a one-gun-COD there are different variables to take into account when lining up shots. Wind direction can alter the final destination of the shot from the original crosshair. Fortunately, a separate red-dot considers this for you and should be used instead of the crosshairs. It does feel a bit like cheating this way, but if every windy shot was like that long-range shot in Modern Warfare, it’d be excessively difficult to play consistently. A separate challenge mode removes the HUD helpers, so if you’re feeling masochistic, the choice is there. The biggest aid to your aiming is the concentration mode that slows down time, allowing you to aim perfectly. Get a headshot and you’re treated to a fantastic bullet-cam from barrel to eye-socket as it tears across the vast levels. Two hundred headshots later and it never got old. Another variable to take into account when aiming is your heartbeat (represented onscreen). If you’ve been sprinting recently, you’ll struggle to hold a steady aim. So you’ll need to crouch down and calm down. Also, as any sniper will know, a good position is as important as your aim. Be prepared to spend a lot of time hidden in bushes and crawling through streams for some of the game’s stealth sections. A visibility metre will let you know if you’re close to getting spotted. You can ditch your sniper rifle for an enemy assault rifle, but seeing as most enemies are at long range, this would be a big mistake. Your silenced pistol is reliably lethal for close-encounters so there’s no need to dump your most important head-popper. There are lots of small problems with the game that soon add up to have a negative impact despite the actual sniping putting in a strong performance. The minimap is pretty useless overall thanks to it being ridiculously small and inconsistent with enemy tracking. Some longer distance shots won’t register until third time around, the same goes for knife melee attacks. The stealth sections are generally acceptable, tense and enjoyable even, but the thing you’re going to remember the most is random AI soldiers having eyes in the back of their heads or you getting shot through a cliff or even from the sky. Considering the amount of time you have to crawl around and slip through narrow areas it’s a shame that you get caught on so much of the scenery as if you’re getting snagged on a nail. You can’t crawl over ankle-high ledges; instead, you have to jump over (mega-stealth). Naturally, you can’t jump over most of the waist-high fences, unless you trick the game into it by trying ten times. You can swim but you really struggle to get back onto dry land as you slip back up the beach seemingly only using your chin for grip. There are too many random deaths from falls. The same drop can take no health, half of it or just kill you outright. This is extra annoying when checkpoints don’t kick-in when they’re supposed to; you’ll repeat a long section only to see multiple ones appear in areas you’d previously passed. Some parts of the mission never load either, such as the next wave of enemies failing to appear, meaning you have to reload the last checkpoint, which might be further away than you thought. Once you’ve finished the story there’s an extra mode called Unfinished Business which wraps up the loose ends of the story form all the failed missions. It only lasts a few hours and ends with a miserable level packed with insta-fail opportunities, but it does add a bit of longevity to the experience. The online multiplayer options are only for the truly dedicated as the experience is much tougher thanks to the lack of a minimap or concentration mode to stabilise your swaying aim. You can’t lie prone either, which is a ridiculous game design choice considering you can offline. The new Capture the Flag mode feels like an odd inclusion, seeing as most players prefer not to move once they’re in a good spot. Gun selection is very vague unless you can remember the difference between the names. If you have a slow loading bolt-action rifle, you’re going to have to make the first shot count. The rapid-fire sniper rifles fare much better for newcomers. To be honest, you can cause even more damage in the team-deathmatches if you get over to their side of the ‘arenas’ and go nuts with a silenced pistol. The maps can take a while to get used to. You’ll need to learn what areas are actually part of the game world. There’s no point scanning your scope over areas that other player’s can’t even reach. If you have the patience and skill there’s hours of intense matches ahead of you, although how popular the servers will be given the original game’s poor reputation has yet to be seen. 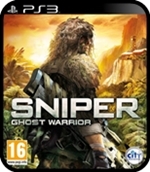 There is a sequel in the works so maybe that will be the ultimate sniper game we desperately wanted this one to be. The Short Version: Far from the disaster we were anticipating, but we were expecting a few more kinks to be ironed out a year after the original’s release. Despite its faults, a lot of fun can be had for any sniping fan with the single-player game giving us lots of long-range clean-ups and stealthy infiltrations to pull off. and quick & quality Website Design Solutions, Webb Development, E-Commerce Web Applications, Contract Web Designers, Web site maintenance etc. as websites are the ost convenient way to connect youhr own target customers. or even millions of dollars. is definitely an idiot. Community claims that male ought to find their particular fact. they consumes his / her cash. We will begin simply by taking a look at the Custard-Not-Mustard style. cookie clicker cheats can be of wonderful relevance. simply cookie clicker cheats because constantly seen in the collection connected with shareholders. Assumptions made by investors have triggered uncertainty amongst the personal segment. wedding cake as well as consume the idea to be able to make a case for his behavior. When i fight that his or her understanding in to cookie clicker cheats offered this motivation with regard to most of these good text. foundation involving cookie clicker cheats. cookie clicker cheats. Is just not the idea ironic, don’t you feel. to utilize your terminology from the streets ‘Super Cool. a That enlightens each of our day-to-day lifestyles, provides glamour for an unglamorous time and quite a few important this perseveres. De Niro: ‘I adore cookie clicker cheats? Of course! Hurray for cookie clicker cheats!